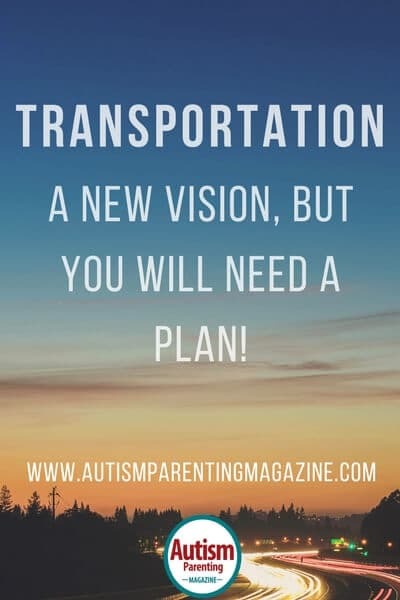 Transportation: A New Vision, But You Will Need a Plan! Transportation for adults with autism spectrum disorder (ASD) seems to pose a challenge and can sometimes hold people back from living and working in the community. So many adults with autism do not have a driver’s license and are therefore forced to use public transportation (if they can manage that system) in order to hold down a job and live outside Mom and Dad’s house. Kansas City is piloting the first public-private rideshare program that is designed to assist those with disabilities with their transportation needs, while also being available to the general public. Individuals can use an app on a smartphone to order a ride, and the idea is that those without a disability will pay a little bit more than those with disabilities in order to allow for subsidized rates for special needs passengers. This public-private partnership opens up a world of opportunities for those with disabilities. It will allow individuals to live anywhere in the community, not just within walking distance of public transportation. It will allow individuals who are on the spectrum to go grocery shopping, go to a job, be involved in a civic organization, and be included in more social activities for a cost that will be less than the private rideshare programs that exist today. This rideshare program is one example of how technology is bringing government and business together to improve the lives of those disabilities and the community as a whole. However, it will not be free. We can expect that as technology continues to improve, the special needs population continues to rise, and the government continues to struggle with funding streams, public-private partnerships will also continue to grow. These partnerships are super, but it also means that in order to take advantage of these offerings, your loved one must be financially prepared to do so…which means you must be financially prepared to do so. In order to be prepared, you must have a vision, and you must create a plan with all the necessary parts. You will need to create a will and have a Special Needs Trust, but those will do you no good if you don’t understand how to actually fund them. You must have a well-thought-out plan that will fund the Special Needs Trust with the proper amount of money in order to support your child’s lifelong support needs. As you are calculating the cost of these needs, it is critical to consider the cost of technology that will be utilized to improve your child’s lifestyle, as well as the necessities of life that government benefits help to pay for and those items the government will not provide. By having a clear vision, and with help from a trained professional who specializes in working with families like yours, you will be able to determine the amount of money your child will need and the most efficient way to fund your child’s future needs. Technology is exciting for everyone, but for those with disabilities, it can mean having a life that is quite independent versus living a life that is dependent on others (such as parents and siblings). Will your child be ready? For more information on how to prepare for the future, be sure to contact a financial advisor who specializes in serving families with special needs. A Special Needs Plan is driven by what they call Unleash L.I.F.E.™—L.I.F.E. meaning Lasting Independence For Everyone™. This is accomplished with education, action, and support in the creation, implementation, and continued monitoring of a specifically-designed lifelong and integrated plan for your family of parents, caregivers, your loved one with special needs, and their siblings. Ryan F. Platt is a registered representative of and offers securities, investment advisory, and financial planning through MML Investors Services, LLC. Member SIPC (www.sipc.org). A Special Needs Plan is not subsidiary or affiliate of MML Investors Services, LLC or it affiliated companies. This article is not a recommendation or endorsement of any products.